Aibo the robot dog may be a thing of the past. But that doesn't mean there aren't plenty of alternatives to splash up to a month's wages on - some of them even smarter than Sony's plastic pet. 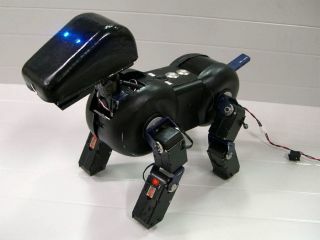 The latest to arrive in Japan is a ¥600,000 (£2,415) robot mutt from iXs known simply as Bj . The matt-black Bj is a Linux-powered platform intended for investigating robotics and artificial intelligence. As such, it's really a research device, although iXs does offer it for sale. The technology behind the 2.5kg, 31cm-tall Bj is impressive. It includes a 533MHz ARM processor, 80MB of memory, Wi-Fi and a webcam that can take full-motion video. It understands its surroundings by using an infrared rangefinder, an accelerometer and proximity sensors in each of its feet. Bj's joints articulate through 16 degrees, allowing it to move head, mouth and legs independently. This is something it learns how to do by reading programming from the USB memory so casually inserted in its rear end. At least owners don't need to pick up after it.